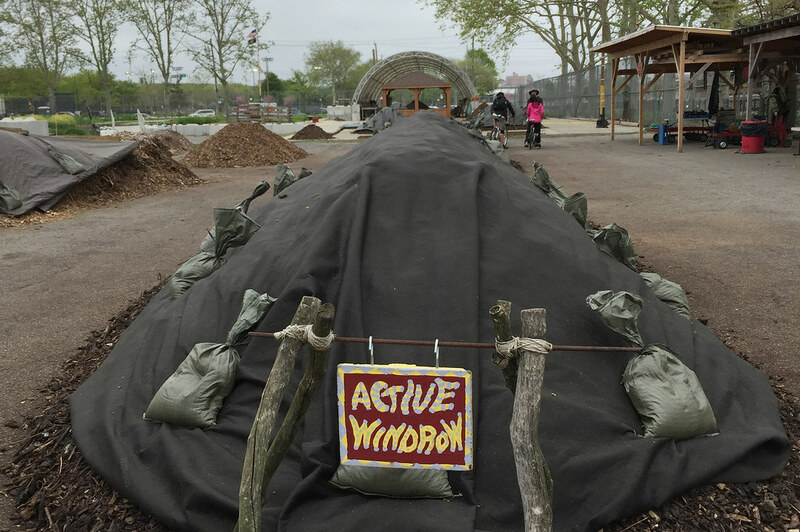 As part of the NYC Compost Project, Brooklyn Botanic Garden manages a remarkable large-scale composting operation on the site of Brooklyn’s Red Hook Community Farm, where our partner Added Value grows food. The project is run entirely on renewable resources (solar, wind, and volunteer labor) and is the largest operation of its kind in the United States. More than 2,000 volunteers help in the compost effort each year, converting 150-plus tons of organic matter from waste to rich soil amendment. Volunteers, students in the farm’s youth program, and the community at large help create a sustainable, urban “closed loop.” Crops are harvested and sold to neighbors, who then bring their food scraps back for composting. More material, collected from the Compost Project’s convenient community drop-off sites, gets added to the mix. Brooklyn Botanic Garden then supplies finished compost rich in nutrients and microbial life to Red Hook Community Farm, as well as to several other urban farms and community greening projects across Brooklyn. And so the loop continues. 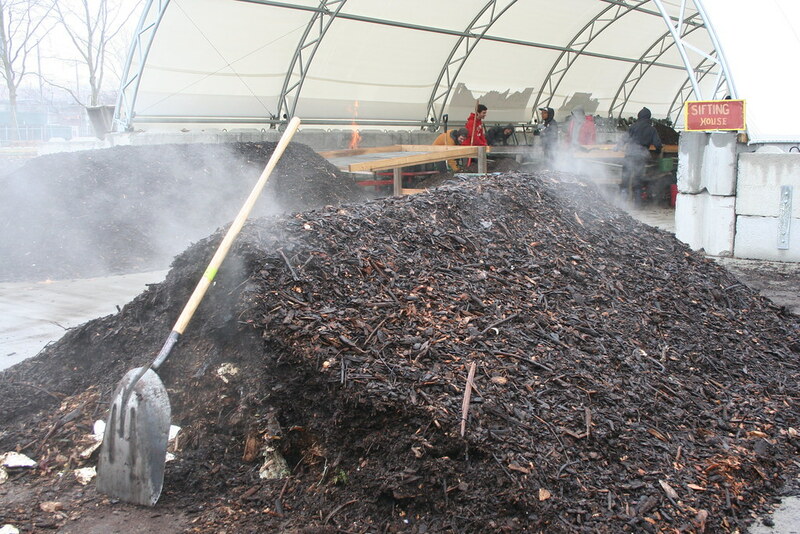 Such large-scale composting is done using windrows—tall, elongated mounds that enhance hot (thermophilic) decomposition. Microbes, hard at work within the mounds, generate the heat, which makes impressive steam clouds—always fun to see on winter days. No RSVP required for individuals; just show up and we'll put you to work! Groups, please contact compost@bbg.org or 718-623-7290 at least one week in advance to coordinate. For composting work, we lift heavy material with shovels and pitchforks and work outdoors, so dress for the weather in clothes and shoes you don’t mind getting dirty. It’s not work suited for children. We work rain or shine—check this page for cancellations due to severe weather, holidays, etc. Also, bring a hot or cold beverage suited to the temperature. Please arrive at the beginning of the session so you can participate in the orientation for various tasks, and plan to stay for the full session. Location: 103 Otsego Street, near IKEA Brooklyn. Enter at the southwestern edge of the farm. OPEN! Volunteer opportunities are proceeding as usual. Come join us! Brooklyn Botanic Garden oversees a large-scale composting operation at Red Hook Community Farm.